Tour date: 1-17 June 2005. Total distance: 1400 km. 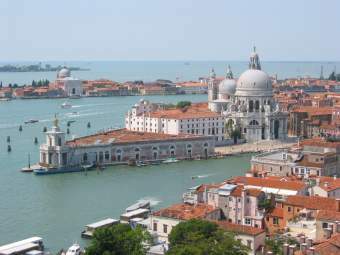 This tour began in Venice because it has an airport where direct flights from Berlin go that are large enough to carry bicycles. And I like to visit the place even though I had been here three times before. And, for the first time, we found time to visit the island of Murano, a quiet and unpretentious little copy of Venice proper where world-famous glass blowers create and sell mind-bending kitsch. The ride from Venice started where we had parked the bicyles, in a small motorcycle lot in an alley that connects Piazzale Roma with the Vaporetto boat terminal. Bicycles are not allowed in Venice. The ride begins with a narrow and dangerous section of the bridge to Mestre, but soon a wide bike path begins for the rest of this 4km bridge. Then we followed the airport signs to get on S14, which is quite busy until the A27 freeway turnoff, and then quiets down a little. After about 24km we took a side road through Caposile, Passarella, Eraclea, S. Giorgio, and Latisana. It's not one of the most scenic routes, but quite nice and far better than S14. In Latisana we rejoined S53, which is S14 under a new name, but here it is quieter because it parallels the freeway. In Cervignano we left S53 (ignore the first sign, it leads to the freeway) to follow S351 to Gorizia, a border town. Although quite small, the traffic picks up considerably for the last few km. We stayed at the International Hotel, a little away from the center but cheap, modern, and convenient. After a 145km ride at 30 degrees C, cold showers were far higher on our priority list than hotel hunting. The hotel is on Via Trieste, about a km southeast of the train station (take two rights at the first two stoplights). Up to here the terrain was basically flat. There weren't a lot of stores or good restaurants along the way, and they follow the usual annoying opening hours in Italy - after around 14:00 it's hard to find food, so plan ahead. 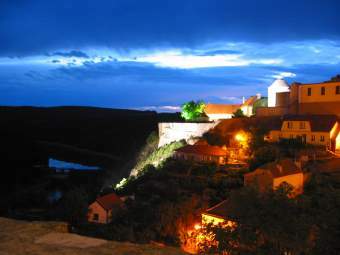 There is also a castle on a hill overlooking the city, just behind the old town. It's a blinding example how to ruin a ruin by "fixing" it with gobs of steel and concrete. It's like someone adding a parking garage and a shopping center to a medieval castle. It's so ridiculous that it's worth a visit. We stayed at the Alibi hostel, which had opened that week. Very clean with friendly staff, but a little noisy and rather far (2.5km) from the old town in a nondescript suburb. A friendly lady at the tourist info near the church and marketplace made the reservation for us. The next day we followed the river Sava all the way from Ljubljana to Brezice, always choosing the side with the smaller roads, often paralleling the train tracks. Most of those roads have a single lane, virtually no traffic, and are fabulously scenic. The road winds its way through forests and small farming villages, often with a view of the river. The road has many hills, all short and easy. Unfortunately we had some light showers that day and no sun, but otherwise this was a beautiful ride. We had excellent pizza at the northeast edge of the town of Radece. Brezice is the last town before the Croatian border. 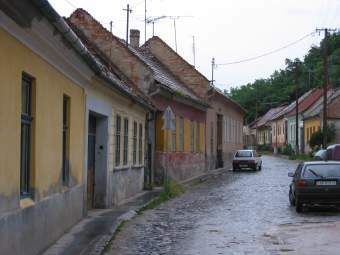 It consists of an old main street, where we stayed at the Splavar Pension and Rafter's Pub, and some residential streets. It almost feels like a Potemkin village; the houses lining the main street just have small gardens in the back where one would expect the next city street, as if it took all the town's strength to put together their one main street. The Splavar Pension has very nice and reasonably priced rooms, but the food is pretty bad in their pub. Zagreb downtown is not marred by concrete monstrosities like Lubljana, and its old part is considerably larger, but not as homogeneous. Curved streets with beautiful old low buildings alternate with ornate baroque palaces, but also nondescript 20th-century additions. Several pleasant wide pedestrian streets are packed with cafes in the middle, back to back to back. Amazing that there would be so many people who have time for sitting in a cafe on a Monday noon. Leaving Zagreb to the east is boring and a fight with traffic. After leaving the city we were on a narrow two-lane road. Here nobody left much space when passing. The first 40km or so after leaving downtown are quite boring - few trees, flat, scattered houses everywhere but no villages, various industrial facilities, and garbage dumps. 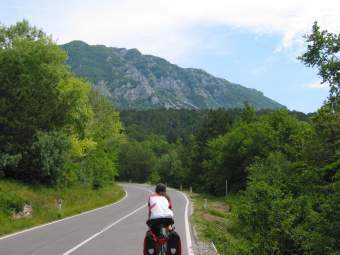 The last 30km to Varazdin became more scenic, with little traffic, small hills, forests, and villages. 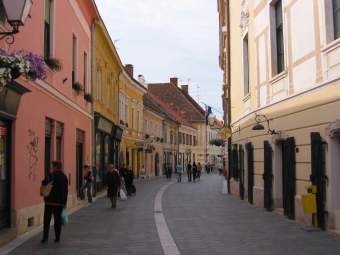 Varazdin is an especially nice surprise, with its beautiful downtown and walled old town. This is the kind of town I like to visit on a bicycle tour - small enough to get into and out of, a scenic downtown to walk in the evening, and small hotels or pensione, restaurants, and shops. 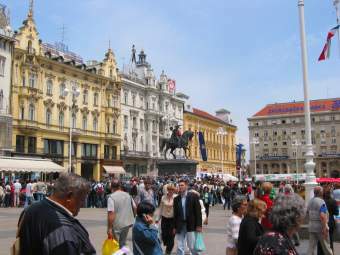 Much nicer than Zagreb actually because although Zagreb has a very nice downtown, it stretches along the base of a hill forever, forcing us to ride busy city streets for hours. In Varazdin we stayed at the Pansion Maltar, whose reception and restaurant is centrally located across from the big red Konzum supermarket, but the actual guest rooms are a km off towards a road and train crossing that made it rather noisy. From Varazdin it's not far to the Slovenian border. Slovenia is a narrow strip between Croatia and Hungary there. As we crossed the border, the temperature dropped from 20 to 11 degrees C, it started raining, and we had a strong headwind. 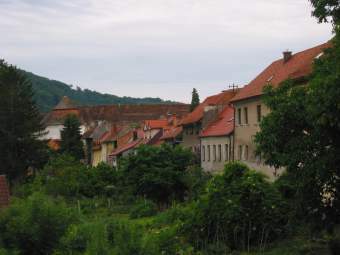 In Hungary we used route 75 all the way to Keszthely, a town at the northwestern tip of the Balaton with many hotels. Along much of the way in Hungary, we had a quite ridable bike path that kept us away from traffic. The road is rather hilly; not steep but one is always either climbing or descending, never level. 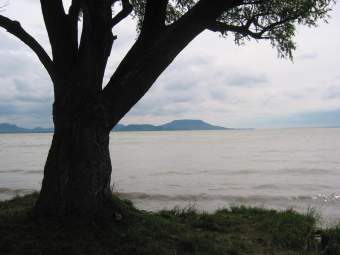 The Balaton is a very large lake, almost 100km long, but very shallow, only 4m at the deepest points. The south shore is basically one long narrow town with a major road running through it, so we decided to ride the north shore, which is less densely built up. In Keszthely we stayed at the Bacchus hotel, which has affordable apartments with four beds. Everybody seems to speak good German and often English as well here. Like in Slovenia and Croatia, we could pay with euros or EC (European ATM) card. There is an excellent bike path along the north shore of the Balaton. Mostly away from the road, quiet, well-paved, and with meticulously labeled signs at every turn. This must be the best bike path I have ever seen. We only ignored the directions at Balacsonytomaj, where the bike path turned inland, but after a couple of km on the main road another similar bike path began. The path is mostly flat, no hills here. Unfortunately the path (and the road) do not often afford views of the lake, but we found a quiet place to stop. Swimming is very limited because the lake is so shallow, and one has to wade a long distance on gravel. All the beaches are on the southern side. We planned to ride to one of the towns at the northeastern tip of the lake, and expected to easily find a hotel there because there are lots of them all along the way. I suppose I should have become suspicious when the language on all the signs turned from German to Hungarian. The towns at our destination were not built for tourists, they are basically ghost towns where everything is locked, shuttered, or for sale, and there are no accommodations and very few restaurants. Eventually we gave up and rode north to Veszprem, which involved climbing some 200m. The town looks real ugly when entering, and the first hotel we checked out had all the charm of a Soviet jail. 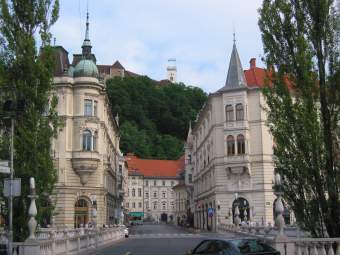 But in the center we found a beautiful baroque old town with cobblestone streets, on a steep hill that overlooks the town. Most of the attractions are lined up on a single main street. We found a small hotel at the back of the hill. The next morning it was raining, not just occasional light showers like two days before, but continuous cold rain that did not stop all day. The temperature had dropped to 8 degrees C. We decided to take the train all the way to Budapest, rather than spend all day riding almost 100km in this weather. Veszprem has a train station where trains leave for the Budapest Deli station, which is very close to the old town of Buda. The train took two hours. 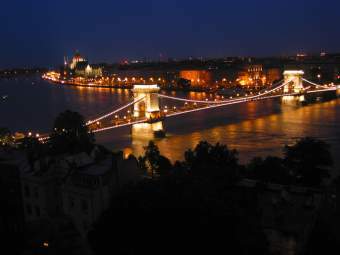 Budapest is divided into the old town of Buda on the north side of the Danube river, and the new town of Pest on the south side. 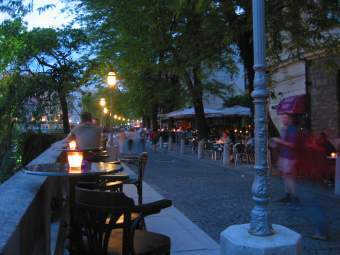 We chose the Hotel Kulturinnov in the middle of the walled section of Buda. It has a grandiose hall with huge marble staircases but large bland rooms with little decoration, and low-end sixties furniture with mattresses that were probably already worn and lumpy in king Bela's time. The walled old town is beautiful and quiet, and has an imposing castle at the south end with great views over Budapest and the Danube river. At the south-west corner of the roads ringing the hill with the old town, where the road turns left towards the bridge, we found the restaurant Aranyszarvas, ignored the tourist menu, and got excellent Hungarian food, including the obligatory Goulash soup, which is served in a hollowed-out dark bread loaf here. Outside the old town, Budapest has sold its soul to car traffic. There are several pedestrian streets that look like anywhere else, except that many of the old buildings look rather dilapidated. Often, only their ground floors that contain high-end boutiques or other shops was perfectly renovated. Pest combines the worst of the old, run-down socialist maintenance, with the worst of the new, choking traffic, transients sleeping in subway stations, and junk tourist traps. The next morning was cold, 11 degrees C, and seemed to be reasonably dry. But as we left it started raining, and didn't stop for the next 50km. The traffic was also pretty bad as well, and so narrow that we got regularly splashed as cars ran through large puddles so deep that the spray reached two meters high. 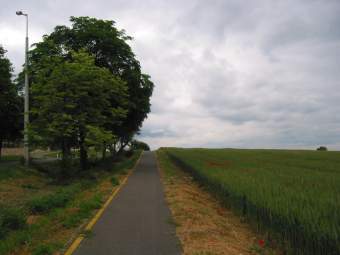 There are occasional bike paths, sometimes quite scenic close to the Danube river (which is rarely visible from the road), but they can be very misleading. Once the bike path signs led us 4km into a maze of dead ends, and another time the signs reappeared after a long absence but led up a hill. We gave up and backtracked after several km on a mud path with sharp stones, having gained about 150m altitude. After these experiences, we ignored all further bike path signs and stayed on the highway, route 11. About 40km from Budapest, where the Danube river starts a series of bends, route 11 becomes quiet and scenic, running through forests with many views of the river. The rain stopped shortly after too, but by that time I was fairly wet despite two layers of rain gear and rubber boots. We were actually hoping to find the well-known Danube bicycle route, but the paths we saw were inadequate, and at some point the signs gave up all pretenses and declared route 11 to be the bike path. Well done guys, signs are sure cheaper than paths. The whole day was basically flat terrain. Finally we reached Esztergom, a town located at a bridge across the river. 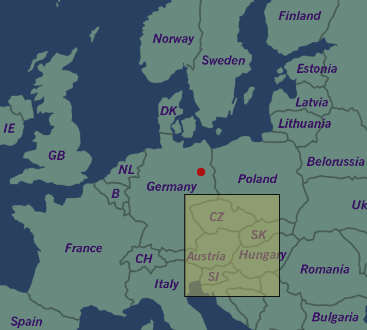 It's also a border town since the river is the border to Slovakia. We stayed at the Hotel Esztergo near the shore and the bridge; the rooms are small but modern. In the evening we wandered around town, and took pictures of its unlikely monumental basilica on top of the hill; it is the seat of the Roman Catholic Church in Hungary and the third largest basilica in Europe (thanks to Marcell for this information). The town itself has some nice baroque streets but is otherwise unremarkable. Food in eastern countries tends to be heavy on meat, although one can usually get more or less well-made pasta and some vegetarian choices. Pizza is plentiful. Juices are flavored sugar water, and breakfast in general is barely edible. There are many German items in supermarkets, and in fact there are German supermarkets and other chain stores all over the place. We also saw lots of old East German Trabant cars on the street, that have all but vanished in Germany. Trabants are ridiculous small plastic cars with noisy two-stroke motors that belch blue smoke. Since the rain started when we entered Hungary, it stands to reason that it would stop when we left Hungary. And so it did. The border check to Slovakia was finished in seconds as usual. 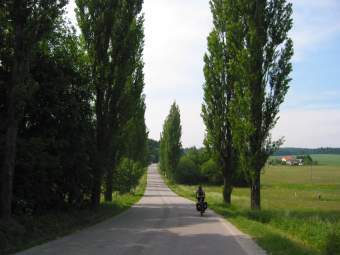 The first 13km on the road that parallels the Danube are a little boring, again with no views of the river, but then trees and villages appear. The road is well-paved and there is almost no traffic (which is why we are riding here and not on the parallel road in Hungary - besides, I bet it rains over there). By then the sun was out and the temperatures soared from 12 degrees back in Hungary to 25 degrees in Slovakia. After 55km, in Komarno, we found an ATM at a giant supermarket called Hypernova, and stocked up on food. Soon after, in Slatna, we turned left into what, according to our map, should have been an even quieter side road that followed the Danube more closely. This turned out to be a gravel road on top of the dike, then became a dirt road, and finally spongy loam with ankle-deep puddles the size of Belgium. I don't know where this sunny place found so much water, I suppose the Hungarians on the other side of the river donated some of their rain. After about five km we turned off onto an asphalt road, where a friendly farmer carefully cleaned our bicyles with his water hose. The brakes and wheels were packed with mud that was threatening to harden to a brick in the sun. Soon that road turned into the road we had been planning to use originally, and we had some 20km of beautiful road through fields and forests to Medved'ov. They have a bridge to the Hungarian side there but we had no intention of getting soaked again, so we rode straight through town and on to Gabcikovo, where we stayed at the Pension Hostad. 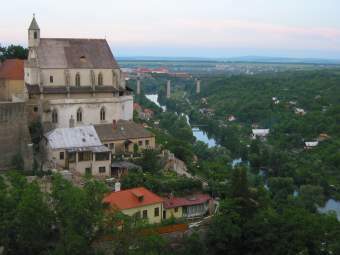 There are two hotels, a few restaurants, and a supermarket in Gabcikovo, but there is very little to sightsee there. The whole day we had sunny and warm weather, perfect road surfaces except during our mud adventure, level terrain, and very few cars. After Gabcikovo, the road stays as scenic and quiet as before, but even as it joins the main highway to Bratislava there isn't much traffic. Entering Bratislava is easy, we just followed the Centrum signs, but quite boring and ugly. Bratislava isn't known for its beauty and so I was expecting some sort of Kaliningrad, but it has a quite pleasant pedestrian street with a large square at the north end. We had lunch and ice cream there. There is a castle on a hill at the south end of that street, but we didn't stay to visit it. It's quite nice but I suppose a city the size of Bratislava should have more of that kind. After crossing the large bridge at the castle, using the bicycle ramp and covered walkway, we took the first streer west along the Danube river, and quickly found ourselves on the Danube bike path. The surface isn't perfect but quite ridable with narrow tires, and we got whisked out of the city through the forest without seeing another car. I have never seen such an easy and pleasant way of leaving the downtown of a large city before. After only 6km we arrived at the Austrian border. Checks were perfunctory as usual, even though we were entering the inner Schengen zone of the EU within which no border stations of any kind exist. Since Italy we had been in the EU, with the exception of Croatia, but outside the Schengen zone. 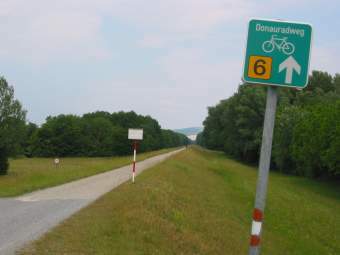 We had been plotting a course to a small town close to Vienna, but right after the border the Danube bike path (called Donauradweg here; the Danube is Donau in German) starts. It took us right to the edge of Vienna downtown. 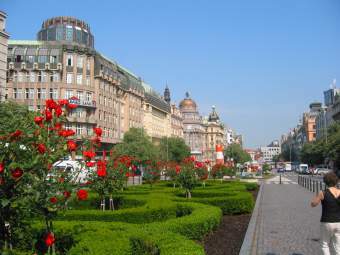 Most of it is on the Danube dike, and very well paved. We were riding on the top of the dike, and there were forests on both sides. There were a lot of other cyclists, but no car traffic anywhere near. 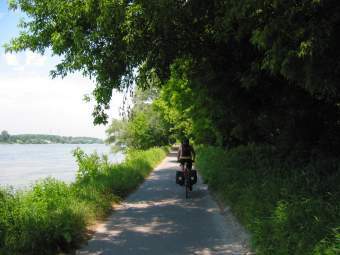 It was very relaxing to ride here; this was how I was expecting the Danube bike path to look like. In fact, almost too relaxing - the path went on and on, the miles flew by, and there wasn't much else to look at than the perfectly straight path and the forests. When entering Vienna, the path widened and actually ran at the shore of the Danube, which we hadn't seen much of before. People were sitting in the grass here, or barbecueing. We took the second bridge across the Danube (actually two in succession; the second has helix-shaped bike ramps) and shortly afterwards found ourselves in a large park, which got us to the edge of Vienna downtown. Another very scenic way of entering a city, opposed to how we got into, say, Zagreb. As any good tourist would, we first went to Vienna's main square, Stephansplatz, which was packed with people. At a newsstand we got a recommendation to try the nearby Kossek Pension, where we indeed got nice rooms for a reasonable price, Am Graben 80m from Stephansplatz. 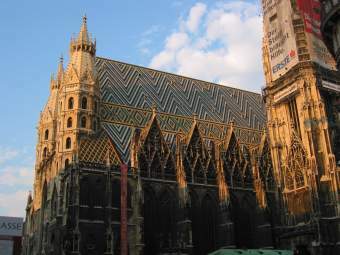 If we had windows to the front, we would have been able to see the Stephan's cathedral (Stephansdom). Quite a stroke of luck that, June is high season for Vienna, and here we found such a convenient place within fifteen minutes just by walking in without a reservation. During the late afternoon and evening we walked around Vienna downtown. Everything is very meticulous, clean, appropriately monumental, and so on, but I don't really feel at home there. As if there were too many imposing facades but not enough life; it feels like a stage set. A beautifully done stage set though. You sometimes hear that Zagreb or Budapest are the Vienna or Paris of eastern Europe, but this is nonsense. When you have seen the real thing it's very obvious that they can't compete, and never will. 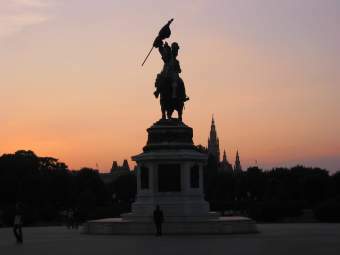 Personally I favor Paris over Vienna (and Prague over Paris) because Vienna's baroque architecture can be a little cloying. 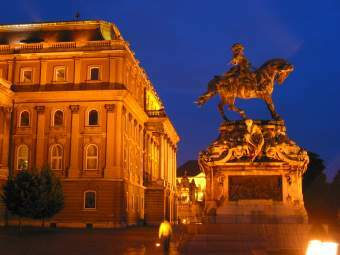 But still, Vienna is a crowning example of 18th century architecture, and the old center of the Habsburg Austrian-Hungarian monarchy. Something that is immediately obvious when riding through Austria after spending so much time in former socialist countries is how meticolous, clean, organized, and arranged everything is. All houses are painted perfectly, all gardens are trimmed perfectly, all cars are new and clean, and all shops are carefully designed. I had the same feeling when I came to Vienna for the first time, after travelling as a student from Turkey through still-communist Czechoslovakia. The next morning we bought Czech maps, and found an excellent bicycle store at Nestroyplatz, where we replaced the brake pads worn off in Hungary's rain and other odds and ends. We left Vienna rather late, and followed a bike path north on the very long and narrow island in the middle of the Danube, which is basically one long narrow park. Another excellent way of leaving a big city. There is a pedestrian bridge at the northern tip of the island to the north shore of the Danube, where the Danube bicycle path #6 resumes. It's just as nice as before, and we followed it until a hydroelectric dam where we turned off towards the town of Stockerau. There is a Spar supermarket here. To avoid the traffic on route 303, we used side streets through Senning and Großmugl to Hollabrunn. This is a very scenic route through the hills of Niederoesterreich, looking exactly as the tourist brochures show it - rolling hills, pastures and fields, small villages, narrow roads, and many nice views. There is almost no traffic. There are two steep 80m climbs with a truly annoying stop sign at the bottom in the middle. The weather was sunny and warm, and we enjoyed a truly novel weather change - a tailwind. In Hollabrunn we had to switch to route 303, which is comparably busy. There aren't that many cars, but the large trucks are annoying. The border formalities were perfunctory as usual, we were just waved through. Those idiots in the US immigration service should come here and take a look at how it's done. On the Czech side, there is a string of truly gross amusement parks, with fake castles and huge plastic dragons and the like. Is that what Austrians come here for? Route 303 is called E59 here, and it took us to Znojmo. We stayed at the Hotel Austis there because it was getting late. As usual everybody accepts Euros, which seems to become a defacto alternate currency in non-Euro EU countries. Prices are much lower than in Austria. Viennese ice cream is light-years ahead of Czech ice cream. To avoid the busy euroroute, we chose small roads from Znojmo through Hluboke Masuvky, Jevisovice, Jaromerice, Lesunky, Chlistov, Heraltice, and Brtnice to Jihlava. 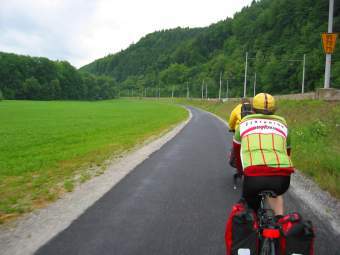 The route is beautiful, like yesterday's tour through the rolling hills and villages in Austria, only more so because there are more hills and more varied forests. Again there is very little traffic, but the hills are steeper. Brtnice looked particularly scenic with its two churches built on a hill, but it involved descending and then climbing almost 100m. After each hill we were a little higher, until we reached 680m. When entering Jihlava we passed a large supermarket. Jihlava was our original choice for staying overnight, but it was too early so we we rode route 523 through Bily Kamen and Kalhov to Humpolec. The first two hotels we tried there were fully booked, but we found a nice and brand-new hotel at a swimming pool, right above the pool's bar, at the southern end of town. Finding the place took an hour. Most towns we rode through were very nice, minus the approach roads in some cases, but Humpolec is an exception. There is really nothing to see here. Even finding a restaurant took a while, but we found the really nice Papa's Garden restaurant at Skolni 1646. As always the menu translations to English and German are hilarious. What is a fruit harpoon? Fruit must be a lot more vicious here than what we get in Berlin. Another day of scenic rides through the Czech hills followed. 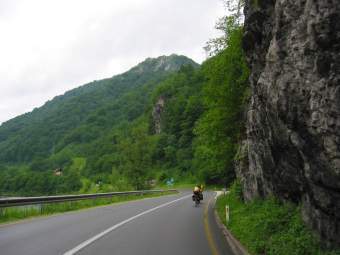 The first section through Sperice and Horice occasionally runs parallel to the freeway for a while, but then turns away through Studeny and Borovnice to meet with route 112 to Vlasim. Traffic was very light on both. Still, to stay on side roads as long as possible, we followed a complicated series of roads through Bilkovice and Divisov, and crossed underneath the freeway once more to Chocerady. We descended 200m to reach the town, but had to pay back every meter as we climbed out of town towards Mnichovice and Ricany. Except for this climb, the hills were lower than yesterday, the climbs shorter, and we lost overall altitude. 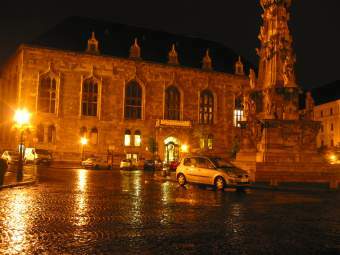 Originally we planned to stay the night in Ricany, but it was still early so we continued to Prague. We were less successful finding quiet side roads here, and spent some 15km on busy city streets. The terrain is almost level after Ricany, and not very scenic anymore. I think it would have been a better plan to enter Prague from the south, not from the east. In Prague we first went to the main train station. The middle floor contains lots of hotel reservation offices, and we found a hotel fairly quickly, for half of what we paid in Vienna, just 100 euro for a triple per night. 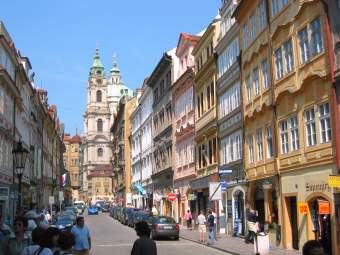 There are also hostels and hotels in more remote parts of Prague. We also bought our tickets back to Berlin. Long lines have cost us almost two hours here. I expected more problems finding a hotel. In those years, just outside downtown, the roofs had holes, windows were missing, and everything looked ready to collapse. No more. 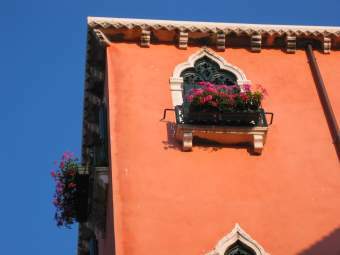 Almost everything has been beautifully restored, and there are cafes and shops everywhere. Even on a Wednesday night the streets were packed with people, although most of them were probably tourists. Unfortunately there was also more traffic. We stayed at the Andante Hotel, which is not very remarkable but friendy, helpful with the bicycles, and just one block from Wenceslas Square (Wenzelsplatz), which is Prague's Champs Elysees. Actually it's more a long and wide boulevard than a square. When we stayed there, the hotel had free WLAN access. They even packed us box breakfasts when we left two days later, very early in the morning. We basically spent all of the following day walking about town, with special attention to the Hradschin. That's the walled castle district of Prague. 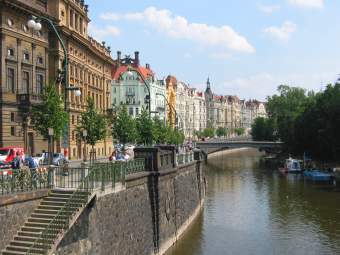 It's on the other side of the Vltava river (German: Moldau), reachable through Karlsbridge, a large pedestrian bridge lined with 30 statues. We walked back across the next bridge, through Prague's new town. ("New" is relative, it dates back to the mid-fourteenth century.) At the other end of the new town, it becomes apparent that not all buildings are beautiful or renovated, and that there are communist legacies here too. But cleaning up all of downtown as they did in the past 15 years is an astonishing achievement. 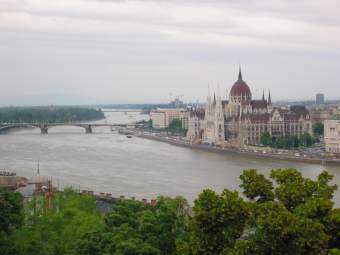 In the evening, we relaxed in the park to the northeast of downtown on the other side of the Danube. It's on a hill and allows a wonderful view of the city. The picture at the top of this page was taken from there.